The 1709 Blog: Unmasking 'La casa de papel'? Unmasking 'La casa de papel'? Gala-Salvador Dalì Foundation, which manages the estate of the Spanish artist, recently challenged the use of a mask having Dali’s features during the famous Spanish TV series “La casa de papel” (“Money Heist” in English), distributed by Netflix all over the world. This TV series, which is now one of the most successful non-English speaking series in the history of the platform, describes the heist of eight robbers assaulting the Spanish National Currency Factory to print their own money, approximately EUR 2,4 billion. 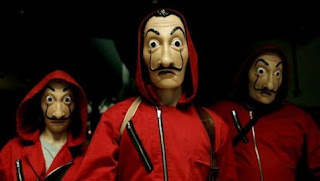 The robbers in the series make the assault using a mask which became one of the most iconic elements of the TV series, together with the red overalls that the robbers and the hostages wear. This mask has the same appearance, curling moustache and eyes of Salvador Dali. This use of artist's image was questioned by Gala-Salvador Dali Foundation, the private institution created by the surrealist painter in 1983 with the purpose of promoting, fostering, protecting and defending the artistic legacy and Salvador Dali’s image. The Foundation requested the producers of the series, Atresmedia and Vancouvermedia, to reemdy to the unauthorized use of the painter’s image, which would infringe Dali’s image rights. For their part, the series producers claimed that the mask was just a caricature of Dali’s image and, as such, did not require any authorization. The alleged caricatural use of Dali’s image could be challenged in different jurisdictions where the TV series is distributed and where caricatures may be treated very differently. In Europe, for example, Art. 5.3 (k) of Information Society Directive 2001/29/EC gives Member States the option to provide for exceptions or limitations to economic rights “for the purpose of caricature, parody or pastiche”, without giving any specific definition of these terms, leaving ground to several interpretations. Possible court decisions in Europe could then have different outcomes. Anyway, newspaper reported that the Foundation and the TV producers are coming to an agreement concerning the past and future use of the challenged mask in 'La casa de papel'.